You might be on vacation, but that seldom suppresses the need for that early morning caffeine fix. If you can’t live without java, Amelia Island Coffee on Centre Street is the preferred choice for locals. Since opening 20 years ago, Amelia Island Coffee has been proudly serving the Amelia Island area. As soon as you walk in, you’ll know that this isn’t a typical coffee chain. The building was once a general store and the old brick walls are still standing to tell the story. The ambiance is laid back and enhanced with folk music and the chatter of local conversation. One of those conversations is in the back of the shop, where a group of local men meet for coffee every morning. According to the Manager Emily, this is all part of the Amelia Island Coffee community. And since this is a coffee shop, after all, the coffee is certainly the star of the show. From chai lattes to a good old-fashioned cup of joe, Amelia Island Coffee’s menu is filled with choices. Feeling overwhelmed, Emily was quick to make a suggestion. 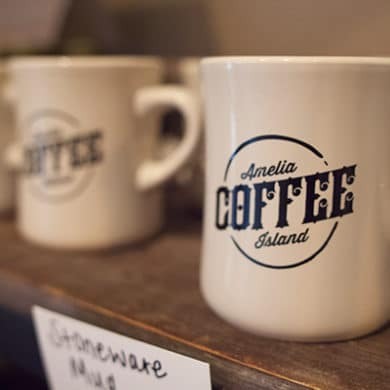 If you appreciate a bite with your morning cup, Amelia Island Coffee also offers a wide range of freshly baked goods and sandwich items that are delicious. Try the southwest omelet wrap stuffed with eggs, cheese, onion, ham and bell peppers. Amelia Island Coffee is also a place where local artists get to showcase their work. Emily even mentioned using some of the in-house talent. Come in, kick back and join the conversation at Amelia Island Coffee. Amelia Island Coffee is located at 207 Centre St, Fernandina Beach, FL 32034. For more information, visit the Amelia Island Coffee website or call (904) 321-2111.